The GURPS supplement How to Be a GURPS GM was released as a PDF in August 2014 and will soon be available in print. But where did this thing come from? “Frustration and unemployment” is the short answer. After a writing sample, an outline, and a contract, I slowly hammered out a manuscript. The raw spreadsheet of Kromm’s forum posts contained just over 8,000 entries! I pared those down by half, then half again, on and on until ultimately arriving at the top 50 that I thought were the most useful and helpful. There was an outline — then another, and another, and another. Lots of discussions, corrections, rewrites, and emails back-and-forth. At long last, one glorious day, I submitted my “final” manuscript. The book itself is intended to illustrate how a new GM (or player) can effectively use the GURPS Basic Set, Fourth Edition to learn the system and create their own adventures. I have always found it much easier to learn by example, so it was important that each chapter of explanations be followed by a chapter showing how to put those explanations into practice. Two chapters discuss preparations before the game, two discuss creating the game, and three discuss actually running the game (three because there is a separate chapter devoted to combat and all its wonderful options). Chapter 1, “Preparing for Adventure,” gives a brief overview of the parts of the Basic Set and the major entries in the GURPS line, and how all that material is a resource for making choices for your game about things like genre, style, power level, and player characters. Chapter 2 introduces a hypothetical gaming group of four friends embarking on their first GURPS adventure, and shows an example of how the GM guides them through the choices from the first chapter to craft exactly the kind of adventure and characters they want. Chapter 3, “Creating the Adventure,” discusses the choices necessary to set up an adventure, breaking the process down into encounters, NPCs, and settings (with a suggestion on how to structure those things in a clear, easy-to-use format). Chapter 4 follows Marcus, our hypothetical GM, as he uses the previous chapter to create his first adventure. Chapter 5, “Running the Adventure,” gives some tips (for before, during, and after the game) about taking that adventure you’ve created and GMing it for the players. Chapter 6 specifically addresses GURPS combat: how to tweak its deadliness, which rules to include or exclude to get the balance of speed vs. realism you’re looking for, a look at how numerous character traits (skills, advantages, disadvantages) affect combat, and more. Chapter 7 then provides a detailed example of putting those two chapters into practice. The cherry on top is a much-expanded version of the Campaign Planning Form from the Basic Set, providing plenty of room for the GM to record all the choices that go into the game in one convenient place. 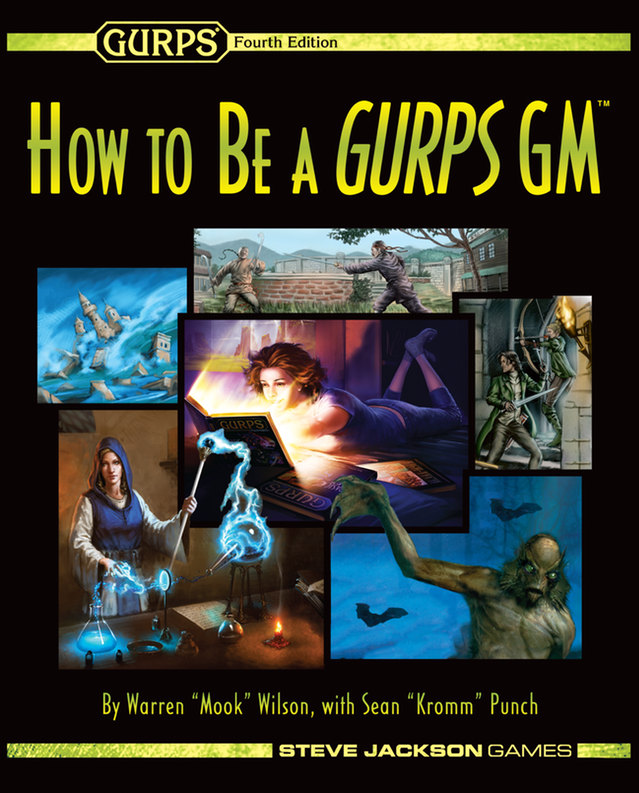 I think How to Be a GURPS GM makes an excellent companion piece for those who might find the extensive options of the Basic Set — the very things that make GURPS such a wonderful toolkit and foundation for any game — a bit daunting. The community response has been amazing, and I’m thrilled that my work was chosen both as an add-on for the Dungeon Fantasy Roleplaying Game Kickstarter and for release as a physical, print-on-demand book. If you’re feeling overwhelmed by the freedom and sheer number of choices GURPS offers, think of How to Be a GURPS GM as a handy roadmap to adventure! We are the Secret Masters. Yet we are munchkins. Go us.